Preface: Significant challenges abound in the astrobiological study of the solar system, similar to those faced by Sherlock Holmes in another context. In the search for extraterrestrial life, a negative result is nearly impossible to obtain, much less interpret. We are bathed in Earth organisms, which makes finding our own kind of life palpably easy and detecting indigenous life on other worlds much more difficult. We are not exploring the solar system to discover life that we have brought with us from home, and we are aware that Earth organisms (read: invaders) could very well erase traces of truly extraterrestrial life. Likewise, we don’t know what would happen if alien organisms were introduced into Earth’s biosphere. Would a close relationship (and a benign one) be obvious to all, or will Martian life be so alien as to be unnoticed by both Earth organisms and human defenses? We really have no data to address these questions, and considerate scientists fear conducting those experiments without proper safeguards. After all, this is the only biosphere we currently know and we do love it! 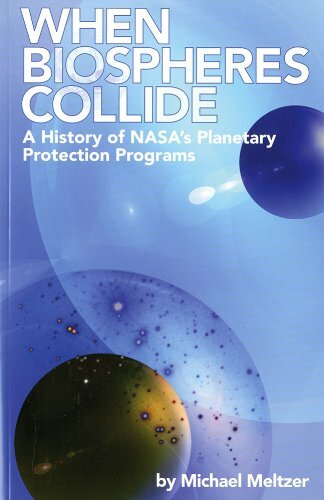 With this volume, Michael Meltzer details the fascinating history of our attempts at planetary protection and those who have worked to protect Earth from otherworldly organisms, while safeguarding other worlds from the all-too-pervasive life on Earth. Such a history is particularly important at this time, since it provides a point of departure for understanding the field as we undertake further explorations. Meltzer’s work will help us face what may well be a crucial topic in the future of the science of life and the future of humans in space. The Panel is concerned with biological interchange in the conduct of solar system exploration, including: 1) possible effects of contamination of planets other than the Earth, and of planetary satellites within the solar system by terrestrial organisms; and 2) contamination of the Earth by materials returned from outer space carrying potential extraterrestrial organisms. The primary objectives of the Panel within COSPAR are to develop, maintain, and promulgate planetary protection knowledge, policy, and plans to prevent the harmful effects of such contamination, and through symposia, workshops, and topical meetings at COSPAR Assemblies to provide an international forum for exchange of information in this area. Through COSPAR the Panel will inform the international community, e.g., the Committee on the Peaceful Uses of Outer Space (COPUOS) of the United Nations, as well as various other bilateral and multilateral organizations, of policy consensus in this area. PPOSS Poster presented at the EuroScience Open Forum 2016 Conference (ESOF held in Manchester, July 23-27 2016). The PPOSS project Coordination and Support Action has received funding from the European Comission’s H2020 Programme (2016-2018) under grant agreement 687373.